The only over-the-counter heartburn medicine that contains the active ingredient lansoprazole. 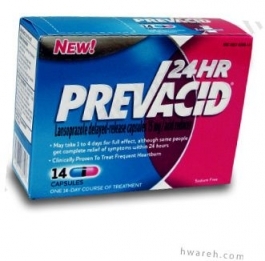 Prevacid24HR is a proton pump inhibitor, or PPI for short, which prevents the production of acid that causes frequent heartburn. Just one pill for 24-Hour frequent heartburn relief! Prevacid24HR keeps heartburn at bay and off your mind, so you can fully enjoy good meals and good times. Adults 18 years of age and older. this product is to be used once a day (every 24 hours), every day for 14 days. it may take 1 to 4 days for full effect, although some people get complete relief of symptoms with 24 hours. 14-Day Course of Treatment. swallow 1 capsule with a glass of water before eating in the morning. take every day for 14 days. do not take more than 1 capsule a day. swallow whole. Do not crush or chew capsules. do not for more than 14 days unless directed by your doctor. Repeated 14-Day Courses (if needed). you may repeat a 14-day course every 4 months. do not take for more than 14 days or more often than every 4 months unless directed by a doctor. children under 18 years of age: ask a doctor before use. Hearthburn in children may sometimes be caused by a serious condition. Active Ingredients: In Each Capsule: Lansoprazole (15 mg). Purpose: Acid Reducer. Inactive Ingredients: Colloidal Silicon Dioxide, D&C Red 28, FD&C Blue 1, FD&C Green 3, FD&C Red 40, Gelatin, Hydroxypropyl Cellulose, Low Substituted Hydroxypropyl Cellulose, Magnesium Carbonate, Methacrylic Acid Copolymer, Polyethylene Glycol, Polysorbate 80, Starch, Sucrose, Sugar Sphere, Talc, Titanium Dioxide.